Captain James Cook of Her Majesty's Ship, Endeavour must be in anyone’s eyes a great explorer and recorder of the World and in this regard has marked similarities with Captain James Kirk of the Star Ship Enterprise in that the initiative was to “explore the unknown”. Cook is one of my top historical characters and if I was inviting dead guests to a dinner, he would most certainly be there. I sometimes imagine what the conversation might sound like between he and David Attenborough Surely these would be two men who have seen more of the social and natural World than almost any others?! 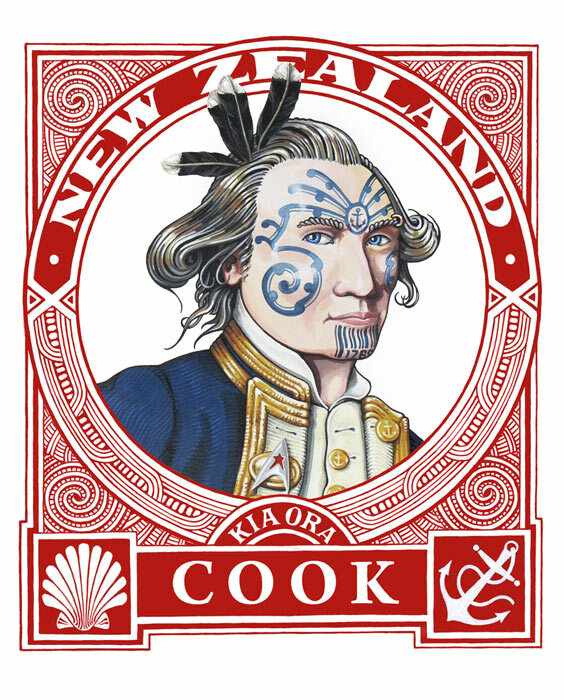 Another implication of this image is that Cook might have been changed in some ways by his meetings with Maori and that he might, given his comments about Maori/Polynesian sea-faring not have thought he was in an ocean "where no man had gone before". On making the comment to a Maori friend that if Cook was to be seen as the Star Trek’s Captain Kirk, Maori might be seen as Klingons he quickly corrected me and said "No, man, we are the bloody Vulcans!" All works printed by the artist on Epson Velvet Fine Art Paper and K3 Archival Inks.